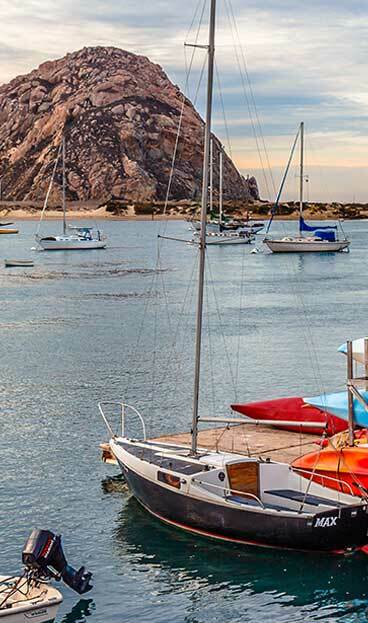 Our most distinctive and recognizable landmark, Morro Rock stands 576 feet tall and is perched on the edge of the Pacific Ocean at the mouth of our harbor. It is home to nesting Peregrine Falcons and is part of a chain of nine volcanic peaks that extend from San Luis Obispo to Morro Bay known as the Nine Sisters. Morro Rock, now a CA state Historic Landmark, was formed about 23 million years ago from the plug of a long-extinct volcano. You can drive to the base of Morro Rock by way of Embarcadero Road heading north. Please note: climbing is prohibited by law.